Here's a step that is definitely going to change the scenario of Legal Education/Law Study. Many times we would have saw people joining LLB Courses, even after their retirement from Govt. jobs. This was due to the withdrawal of Clause 28 of Schedule III of Legal Education Rules, 2008 by Bar Council of India vide resolution number 200/2013, thereby age restriction was removed for LLB Courses. But after the said withdrawal of rules was challenged in High Court, Hon'ble Court gave it's verdict against the Bar Council of India. Further when BCI challanged the High court order in Apex Court, Hon'ble Supreme Court of India upheld the High Court order. Thus, the Clause 28 of Schedule III of Legal Education Rules, 2008 is applicable and limits the upper age limit of admission into LLB Courses to 30 years for general category. There is technical flaw in the order of the honble supreme court. 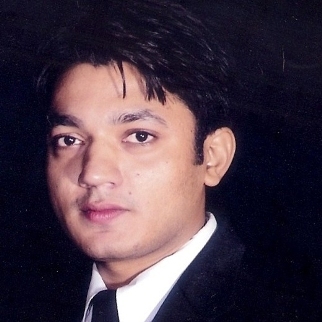 In the year 2009, the age bar clause of thr BCI was challenged by me in punjab and haryana high court. (CWP NO. 20966 of 2010) which was allowed by the then ACJ Honble mr. Justice M M Kumar. BCI didnt challenge the order and it attained finality. 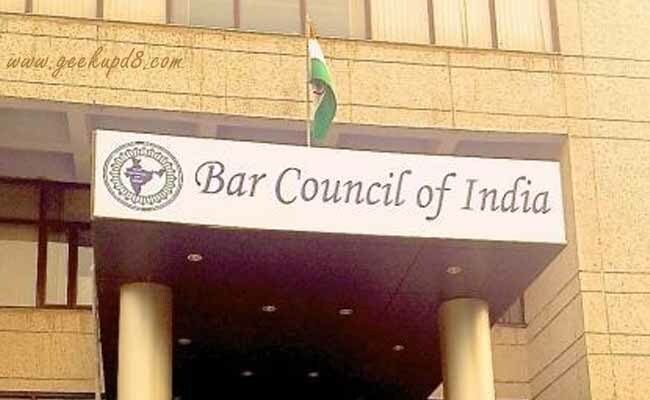 There after BCI formed one man committee to mull over the matter and ultimately on the recommendations of the committee the agr bar clause was finally deleted from the statutes paving ways for persons above the age of 30 to take admission in law. But the constitution of one man committee was challanged in madras high court which petition was allowed and committee was held to be unconstitutional. supreme court so upheld the order of the madras high court and resultantly recommendations of the committee also happened to be unapproved. So the thing to be understood here is that it was the constitution of one man committee which was challanged not the age bar clause. So th3 order passed by thr punjab and haryana high court in the above CWP still holds good. So BCI needs to understand it. If somebody files a review petition into the matter before the supreme court the age bar clause can again be got struck of. Even otherwise age can never be a restriction in attainment of education. What do you mean by calling the restoration of age-bar as a step to improve the standard of advocacy? If judges can serve till 60+ years, or advocates till they die, what makes 'elderly' Govt servants unsuited? These 'elderly' people bring tremendous experience and domain expertise with them which people can't gather in a lifetime. These 'elderly' persons pass the entrance exam just like anyone else and join LL.B on their own merit. 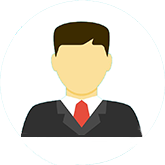 These 'elderlies' don't compete for your jobs in corporate law firms. Money is not a primary concern. The Supreme Court order that you speak of merely upheld the Madras High Court order citing a procedural impropriety by BCI in waiving the age bar, and not on merits. Well you needn't to stay anonymous to give a commment. This decision is of people far mature than you and me. If government thinks, that a person is not capable to work after a certain age, than why law profession is open for them. And what you said about judges and lawyers serving 60+ is something perhaps, you haven't imagined before writing. Lawyers, Judges serving in legal profession gain so much exposure and expertise that, a retired govt. employees can't get at all even after spending spending rest of their lifetime. Liking details given by advocate Sharma. This challenge is to the method and not to decision. Upon using right method, decision is valid. The age must not be bar for any studies/profession as it is in direct contravention with fundamental rights. Learned advocates can correct me please. Helpful for all advocates, whose age up to 30 years. No one senior students come to law colleges. By this judgement, junior students can come to law colleges. This is the best judgement after Independence. Thanks to the Honble Supreme Court of India. Has the BCI filed their reply as there is a writ filed against them regards to this issue. From grammatic and other linguistic mistakes in the comments, level of intelligence of young law entrants can easily be guaged out. If they are senior lawyers, in that case, they themselves speak of their level. The matter is now sub judice and pending before various HIgh Courts including High Court of Kerala with BCI on the party array. This was due to the withdrawl of Clause 28 of Schedule III of Legal Education Rules, 2008 by Bar Council of India. But, after the said withdrawl of rules of legal education was challenged, High Court gave it's verdict against the Bar Council of India. Further BCI challanged the high court judgment in Apex Court, and Supreme Court of India, upheld the High Court order. 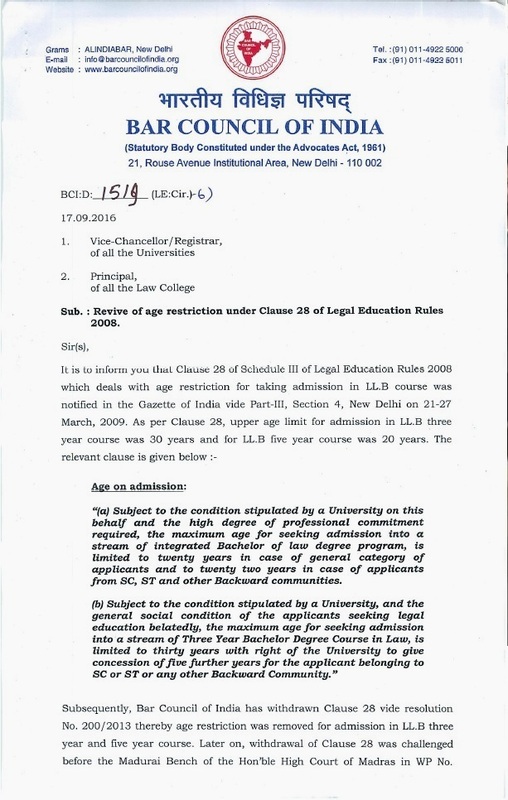 Thus, the Clause 28 of Schedule III of Legal Education Rules, 2008 is applicable and limits the upper age limit of admission into LLB Courses to 30 years for general category.